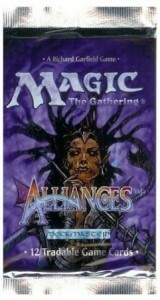 On June 10th, 1996 Alliances was released as an expansion set for Magic: the Gathering’s Ice Age. It changed the game from the moment it’s cards were put into decks at that time. The set totaled 199 cards, which is deceiving because there were only 144 cards in the set. This was due to the fact that 55 of those cards had two versions of artwork. Ten cards in each color and five Artifacts have two versions of artwork, this was the first time since Fallen Empires, and one of the last times, a set would have multiple versions of artwork. The color breakdown was as balanced as any set; 8 Lands, 31 Black cards, 31 Blue cards, 31 Green cards, 31 Red cards, 31 White cards, 10 Gold or Multicolor cards and 26 Artifacts. Unlike the last two true expansion sets, Homelands and Fallen Empires, Alliances had actual rares, 46 rares to be exact with 43 Uncommons and 55 Commons. Gorillas, Homarids, Soldiers, Birds, Rats, Skeletons, Barbarians, Clerics, Knights, Elves, Goblins, Merfolk and Legends either had standout creatures in the set, or bolstered their already great tribes. Names like Balduvian, Kjeldoran, Krovikan, Lat-Nam, Lim-Dul, Phyrexian, Soldevi, Stromgald, Tresserhorn, Varchild and Viscerid were made common. 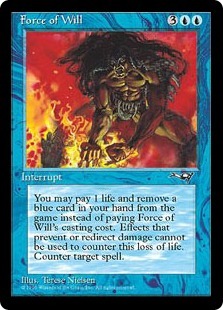 Force of Will from Alliances. The “Pitch Card” Counterspell. 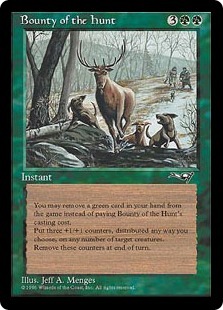 The “Pitch card” spells that can be cast for no Mana by discarding or through a similar penalty were first introduced in Alliances, one for each color and resembling an existing card: Bounty of the Hunt resembles a more versatile Giant Growth, Contagion serves as a double Weakness, Force of Will acts like a Counterspell, Pyrokinesis resembles Pyrotechnics and Scars of the Veteran acts like a huge Sacred Boon. 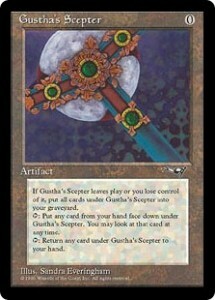 There were also three Zero casting cost Artifacts; Gustha’s Scepter, Lodestone Bauble and Shield Sphere. Two Sorceries and one Instant, totaling three spells that started their text with “Target opponent chooses one” and one card stated a this or that concept, which would be later turned into the Charm cards, 48 of which exist at this time. At least 10 cards in the set mess with your library in some way and there were nearly a dozen new cantrip cards that appeared in the set as well. With these, I would say that Alliances was the peak for library manipulation, between drawing, shuffling, and transferring cards from your graveyard, hand or library to other locations. Existing deck strategies that got help from the set, all of them, but to be fair, most commonly discard decks, poison decks, Millstone decks, permission decks, direct damage decks, no I really, meant all of them. Unlike the last expansion Homelands, Alliances contained 10 Gold cards which were split in half, five of them were two color combinations and five of them were three color combinations. By comparison Ice Age, a much bigger set, had 25 Gold cards and only five of them were three color combinations and Legends, also a much larger set, had 55 Gold cards, of which only 19 were three color combination and five of those were the Elder Dragon Legends. Eight Lands were printed in Alliances and these were not your ordinary Lands. Five of them were color coordinated and three were still useful and all of them changed the way Lands were looked at. “Pitch cards,” zero casting cost artifacts, new names and tribes, old names and tribes, deck manipulation, unique Lands and a higher percentage of three color Gold cards than Legends, this set had it all. The Lands of Alliances: These aren’t your Basic Lands. Eight Lands were included in Alliances, three non-color specific Lands; School of the Unseen, Sheltered Valley and Thawing Glaciers, and five color specific Lands: Balduvian Trading Post for Red, heart of Yavimaya for Green, Kjeldoran Outpost for White, Lake of the Dead for Black and Soldevi Excavations for Blue. 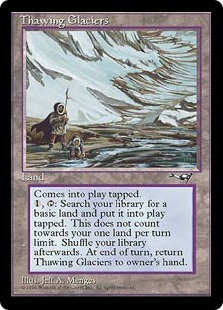 Sheltered Valley gave you one colorless Mana, but was a Legend of sorts in that only one could be in play at any time and “during your upkeep, if you control three or fewer lands, gain 1 life.” Both were useful, but it was Thawing Glaciers that was the highlight of these non-color specific lands. If it didn’t come into play tapped, it would have been restricted or even banned before it was printed, but since it wasn’t an every turn scenario, Thawing Glaciers was a must have in any deck that relied on more than two colors. 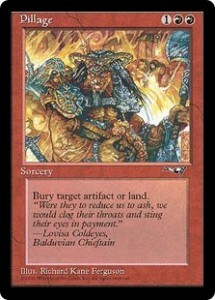 All of the color specific Lands in Alliances had the same cost: “When ______ comes into play, sacrifice and untapped [basic land of the coordinating color] or bury ______.” Because the cost of putting these Lands into play was to sacrifice a basic Land, these were best used if put into your deck in addition to your Mana ratio preference and not instead of another Land. The good news was, that in addition to their unique abilities, Balduvian Trading Post and Soldevi Excavations, didn’t add one Mana to your Mana pool, they added one colorless Mana AND one Mana of the corresponding color to your Mana pool. Back then, when Mana burn was still a drawback, you had to weigh their use more closely than you do now. 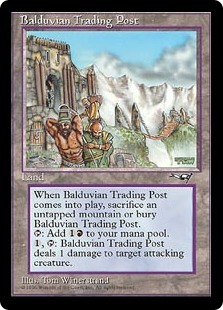 Balduvian Trading Post’s other ability was to deal “one damage to target attacking creature.” Unlike the other four Lands, this was the one ability I saw used the least. 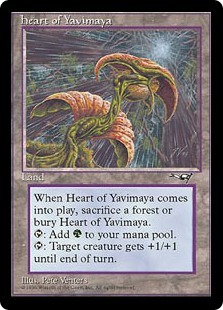 Heart of Yavimaya’s ability was “target creature gets +1/+1 until end of turn.” Being that heart of Yavimaya was the Green Land, this was very useful in Elf decks, but wasn’t exclusively used in them, as any creature is better with a +1/+1 boost. 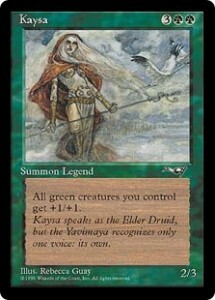 I once saw someone attack on turn three with a 3/4 Kird Ape because of heart of Yavimaya. That’s not something you see everyday and that’s why I remember it. 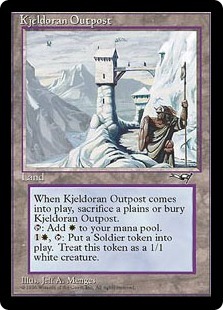 Kjeldoran Outpost was a huge contribution to the White weenie decks, as well as the Fruity Pebbles and Cocoa Pebbles decks of its time a year later when Goblin Bombardment was released with Tempest. 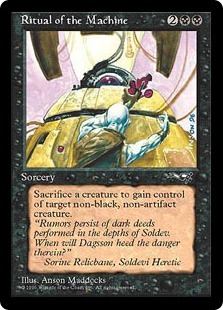 It was also helpful in Black/White decks for keeping up on creature sacrificing upkeep costs. For one colorless and one White Mana, you could Tap the Outpost to “Put a Soldier token into play. Treat this token as a 1/1 white creature.” At that time, this was monumental! A soldier a turn for as long as you have the Mana to do so, or until your opponent destroys the Outpost. Need more creatures for upkeep costs or to bolster your army? It costs two Mana and you can do it every turn, should you choose to. 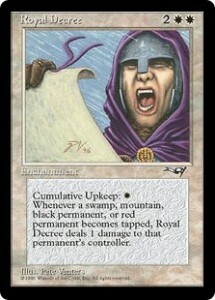 Add a Crusade or Angelic Voices to the mix and you are not pumping out 1/1’s, you’re pumping out 2/2’s or 3/3’s. Lake of the Dead was a permanent Dark Ritual for Black. Of course, you had to sacrifice a Swamp as part of the activation cost, but it gave you four Black Mana. The drawback, was never enough of a hindrance to players of Black, not to put at least two in their deck. 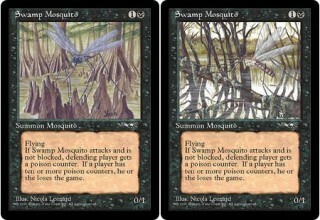 Granted, back in the day, if you only needed three of those four Mana, you were going to take a point of Mana burn, but that rule doesn’t exist now, so you can be free to use Lake of the Dead for however much Mana you require without the worry of Mana burn. The sacrificing an untapped Swamp as part of its casting cost was of small consequence to the opponent you played this against. You now have access to four Black Mana. Sengir Vampires can come out faster, the killing blow from a Drain Life could be more powerful, the howl from Beyond on an unblocked creature that much more dangerous. Soldevi Excavations, was just as an offensive a Land as Lake of the Dead, but without the drawback of having to sacrifice a Land for it’s ability. This was Blue’s answer to Sylvan Library, except it is better. With Sylvan Library, you’re still going to have to draw the cards you don’t need, with Excavations you can just save them for later and increase your odds of getting the draw you need. This is library manipulation at it’s best. If you can get two Excavations out, since you’re playing Blue, you can use the two Mana you saved for that Counterspell, if you didn’t use them and look at the top card of your library twice at the end of your opponents’ turn. That’s a huge card draw advantage, not because you’re drawing more, but you’ve just increased the odds you’ll draw what you need. The bottom line is that the Lands in Alliances have the most useful non-mana producing abilities of any set of Lands from any single set. It’s just astounding how much, these eight Lands changed the strategy of the game. Of course, you had to draw them, but eventually you would and that would change the game in your favor most of the time. The Color Black in Alliances: Power, Poison, Sickness and Control. The Black in Alliances gave help to many different types of decks, in addition to adding more powerful spells and big creatures to Black’s already impressive arsenal. Contagion the Black “pitch card,” was a double Weakness, putting two “-2/-1 counters, distributed any way you choose, on any number of target creatures.” This was very useful as it could kill two Birds of Paradise in one shot or shrink a Shivan Dragon down to a measly 1/3. Fatal Lore gave target opponent the choice to allow you to draw three cards or they can draw up to three cards and bury two of their creatures. Phyrexian Boon was a doubly useful card as it could be an Unholy Strength for Black creatures or a -1/-2 for non-Black creatures. Misinformation let you put up to three target cards from an opponent’s graveyard on top of their library in any order, which is a wonderful way to mess with their decks, especially if you’re playing with a discard deck. 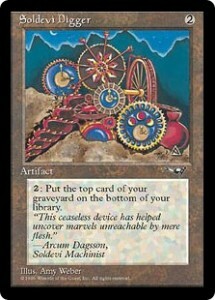 Reanimator decks were also aided by Ritual of the Machine, a Sorcery which stated, “Sacrifice a creature to gain control of target non-black, non-artifact creature.” This was great because it allowed you to get your hands on any creature on the board and if you killed it, you could still get it back with your trusty Animate Dead. This card was also great with helm of Obedience, as you could sacrifice an already stolen creature to steal another. Casting of Bones was not just a simple cantrip, it allowed you to draw not one, but three cards, then choose and discard one. 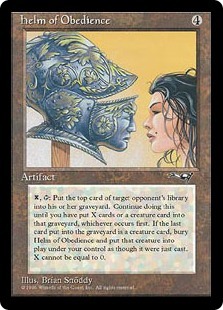 That kind of card draw and library manipulation was new to Black at this time and was heavily used. The other benefit, for reanimator decks, was that it easily allowed you to put that big creature into your graveyard, if it was one of the three cards drawn. 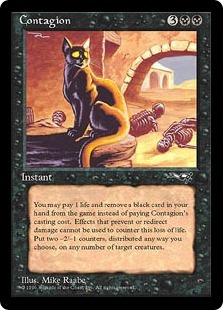 One of the other highly used Black cantrip cards was Fevered Strength, which was an Instant giving target creature +2/+0. 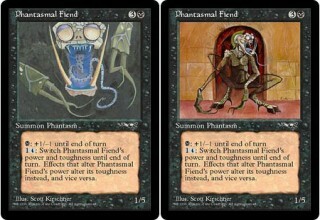 There were two Black cards that relied on other colors to work; Balduvian Dead and Phantasmal Fiend. Balduvian Dead was a 2/3 Zombie that for two colorless and one Red Mana, removed a summon card from your graveyard and put a 3/1 mini Ball Lightning into play, meaning that it was unaffected by summoning sickness and was buried at the end of that turn. The best part of this was that it was not a tapping ability, so if you had the Mana you could really build up your army for the final attack. Phantasmal Fiend was a 1/5, that could get a +1/-1 until end of turn with Black Mana or for one colorless and one Blue Mana could switch it’s power and toughness, starting it out at a 5/1 until end of turn. Diseased Vermin is a one of the greatest Rats to be printed in Magic. If it damaged an opponent Diseased Vermin got an infection counter. During your upkeep Diseased Vermin dealt one damage to a single target opponent it had previously damaged for each infection counter on it. This was best used in a duel, as it was a sure target for your opponents in Melee games. Even still, with a Tawnos’s Wand, you could get in a few cheap hits and keep pounding them without even attacking. Swamp Mosquito was a 0/1 flyer that could not be ignored, as it gave opponents poison counters for not being blocked, again another card that worked well with Tawnos’s Wand or Dwarven Warriors. Dystopia had a Cumulative Upkeep of 1 life, but could easily help get rid of White and Green permanents while it was in play. Keeper of Tresserhorn was a great 6/6, that if unblocked would deal no damage, but instead that player would lose two life, an easy get around for those pesky COPs (Circle of Protections), while Soldevi Adnate was a great source of Mana, as it allowed you to sacrifice a Black or artifact creature to gain it’s casting cost in Black Mana. 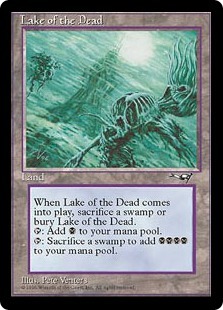 Pair the Adnate with a Lake of the Dead and you’ll have all the Mana you can spend. Blue’s library of control spells was extremely boosted by Alliances and none was more feared than Blue’s “pitch card;” Force of Will. Although you had to lose one life and remove a Blue card in your hand from the game, the ability for Blue to be completely tapped out and still counter a spell was feared by every opponent of Blue. 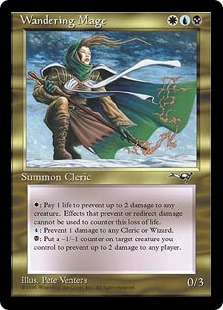 But even Force of Will wasn’t the best Counterspell type card in Alliances, that title belonged to Arcane Denial. Arcane Denial was brilliant and useful on many levels. First, it didn’t cost two Blue Mana, it was one colorless and one Blue Mana and second it was a cantrip. Although it did allow for the caster of the countered spell to draw two cards during the next upkeep, you still got to draw one and that is always a risk worth taking. 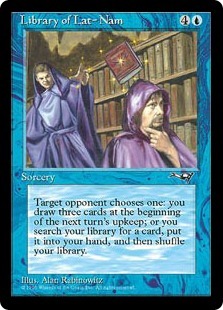 But Blue’s control wasn’t limited to opponent’s spells, Blue was the color for library manipulation in Alliances. 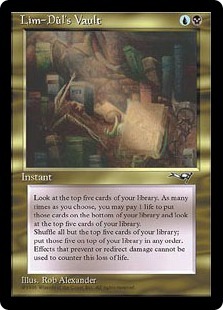 Browse was an extremely powerful Enchantment for a cost allowing you to “Look at the top five cards of your library and put one of them into your hand. Remove the remaining four from the game.” Although, you won’t be getting those four cards back, it allowed you to easily speed through you library for the card you needed much faster than any other spell in it’s time. And as an enchantment it could be done many times over. 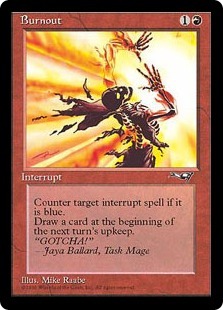 As I said before, control wasn’t completely in the Interrupt department, False Demise, an Enchant Creature, returned enchanted creature to play under your control, which means you can get your creature back after it is dead or steal your opponent’s creature once you’ve found a way to kill it. 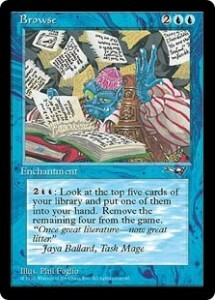 Diminishing Returns was also huge for Blue’s mastery of the library. It was a Sorcery that stated, “Each player shuffles his or her hand and graveyard into his or her library. Remove the top ten cards of your library from the game. Each player draws up to seven cards.” Diminishing Returns is one of the ultimate reset buttons for your deck, provided you don’t lose every card you’ll need to win in the ten removed from the game. More than likely if you’re playing a balanced deck, the odds are in your favor, so be aggressive and play the odds. Foresight allowed you to remove any three cards from your library from the game and draw a card at the beginning of the next turn’s upkeep, which is a great way to weed out any cards in your deck that are useless against your current opponent. Removing useless cards or land from your deck raises your odds of getting useful cards from your draw, it’s simple math. Lat Nam’s Legacy allowed you to “choose a card from your hand and shuffle that card into your library to draw two cards at the beginning of the next turn’s upkeep,” which is just another way to change your odds of winning, one way or another, especially if you know what your draw is and you don’t need that card. Plus the card draw is helpful as well. Meanwhile, Library of Lat Nam forced your opponent to make a decision and choose whether you get to draw three cards or search your library for a specific card, either one is helpful and either could lead to the demise of your opponent. Soldevi Sage furthered your library manipulation, by sacrificing two lands you could draw three cards and then choose and discard one of them. With all of this control and manipulation of the library, it’s a wonder that Blue players didn’t spend all their time reshuffling their decks back in the day. Seriously, with all that shuffling, how could their be any time to actually play a spell? 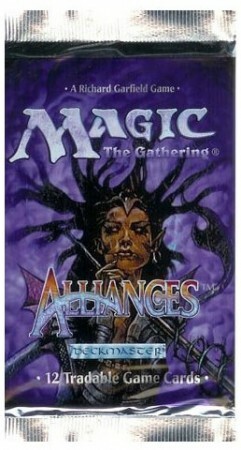 The Blue cards of Alliances were not all about control and shuffling cards in and out of your library. Phantasmal Sphere was such a balanced card. You get a flying creature with an upkeep and when it dies, your opponent gets it without the upkeep that’s a very interesting if not completely balanced card concept. Storm Elemental was a 3/4 flying Elemental, that could tap target creature with flying by paying one Blue Mana and removing the top card of your library from the game. It’s a fairly expensive way to clear the skies, but it does clear the skies. Suffocation was Blue direct damage for Red only, as it only worked if a Red Sorcery or Instant dealt you damage, at which point it would deal four damage to the spell’s caster. It did have a cantrip, but if you didn’t have it in your hand at the right time, it just becomes a great card to drop for all of those other spells that require a discard of some kind. 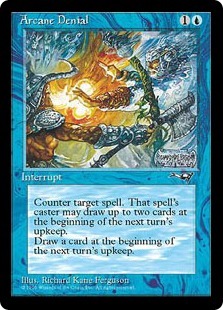 Tidal Control had a Cumulative Upkeep of two colorless, but allowed any player to pay two colorles or 2 life to counter target Red or Green spell. Although the upkeep was steep, if might keep you in the game long enough to win. Tidal Control also makes you more friends than enemies in melee games. Just make sure the Red and/or Green players are dead before it goes away, because you’ll become their primary target. 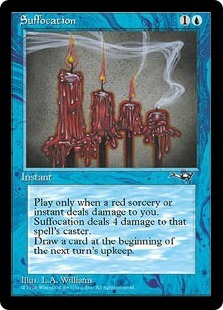 The most expensive upkeep cost in Blue’s run in Alliances was Thought Lash, which was a “Cumulative Upkeep: Remove the top card of your library from the game. If you do not, remove your library from the game and bury Thought Lash.” While it did give you the ability to remove the top card of your library from the game to prevent one damage to you, the thought of removing your library from the game was an expensive drawback. Better hope you can keep a Despotic Scepter from Ice Age in play to bury it, before Though Lash buries you. Bethnic Explorers was a new Merfolk printed with Alliances, which was big news back in the day because not every set was going to net you new family members for existing tribes. Viscerid Drone was an addition to the Homarid family and their armor, Viscerid Armor was a great enchantment giving target creature +1/+1, but giving you the ability to bounce the enchantment back to your hand. Merfolk and Homarids aside, it was the Spiny Starfish that shown brightest in the sea during Alliances’ reign. Spiny Starfish was a 0/1 that had regeneration and the ability to put a 0/1 Blue Starfish token into play at the end of turn for each time it regenerated. 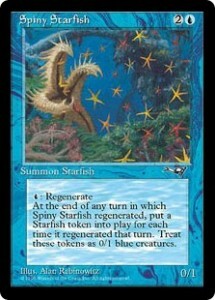 The idea that attacking will cause you to tap Mana to regenerate the Starfish is great, because it’s Mana that can’t be used to cast a Counterspell or Arcane Denial, but it could also lead to a huge army of 0/1 Starfish tokens. That is until you draw a Sunken City and they all become 1/2 Starfish tokens. The Color Green in Alliances: Nature, Elves, Gorillas and Ants, Oh My! Alliances’ Green cards were rich in creatures, both powerful and big, a new tribe; Gorillas, Enchantments and a few other spells. Green’s “pitch card,” was Bounty of the hunt. Bounty of the hunt could be used like a Giant Growth, but you really had your choice of how you wanted to use it. “Put three +1/+1 counters, distributed any way you choose, on any number of target creatures. Remove these counters at end of turn.” Therefore, you could use it to boost one, two or three creatures, so it really is just a more versatile Giant Growth. Never before or since has one card been a part of such a monumental pursuit as Elvish Spirit Guide was in building a deck for the chance at that first turn Shivan Dragon. I know it can be done, I’ve done it before, but it’s all luck, however it is nothing without Elvish Spirit Guide. If you don’t want to cast the Shivan, insert big Red or Green creature here, your Elvish Spirit Guide will help you get to it faster. 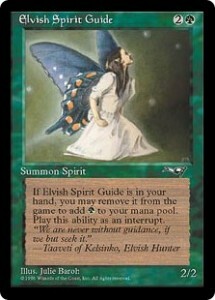 Elvish Spirit Guide wasn’t the only elf to grace Alliances with its presence. Elvish Bard and Elvish Ranger and eventually Fyndhorn Druid (Later errata eventually made this Summon Druid a Summon Elf Druid) joined the family of elves as well. Elvish Bard is a 2/4 with a built in Lure, Elvish Ranger is a buff 4/1 elf and the Fyndhorn Druid gains you four life, if it is blocked and dies. Of all of these, it’s the 4/1 Elvish Ranger that was most curious, because even though it only had a toughness of one, it only cost two colorless and one Green Mana. A fairly cheap 4/1, to go along with all of those little 1/1 elves in your Elf Deck. The Gorillas made their debut as a tribe, although all Summon Gorillas are now Summon Apes, this was their coming out party. Gorilla Berserkers is a 2/3 with trample and rampage:2 and “cannot be blocked by fewer than three creatures,” making it a guaranteed 8/9 when attacking, if it is blocked. The Berserkers were joined by Gorilla Chieftain, which had regeneration and the huge Gargantuan Gorilla, a 7/7 behemoth of a creature with an upkeep of sacrificing a Forest. The Gargantuan Gorilla also had a built in Arena function, so it wasn’t just a 7/7, it was a 7/7 that was willing to duel and could usually defeat any creature your opponent controlled. 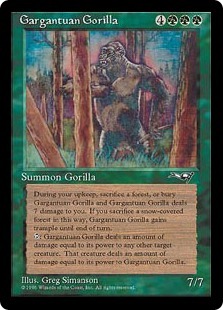 Additionally, if you sacrificed a Snow-covered Forest, Gargantuan Gorilla gains trample until end of turn. The Elvish Ranger may have been cheap for a 4/1, but there was an even more offensive creature in Alliances for Green; Deadly Insect, which cost four colorless and one Green Mana for a 6/1 that could not be the target of spells or effects. This made the Insects hard to keep around, but there were other cards in the set to help with Deadly Insect’s weak toughness. Enter the Legend, Kaysa. Kaysa is a Summon Legend for three colorless and two Green Mana that is a 2/3 with one great ability, “all green creatures you control get +1/+1.” That’s it, all of a sudden, your 6/1 Deadly Insects has a mediocre toughness as a 7/2. Your Elvish Ranger is now a 5/2 and all of the other little 1/1 elves that you put into your deck are now 2/2’s. The best part of Kaysa is that she effects only your Green creatures, not all Green creatures. Kaysa is a great way to break the stalemate of an Elf deck vs. Elf deck, as all of your elves will be a little bigger than your opponent’s elves. Nature had a big say in Alliances with Nature’s Chosen, Nature’s Wrath, Splintering Wind, Taste of Paradise, Tornado and Undergrowth. Nature’s Chosen was an Enchant creature that gave you the ability to untap enchanted creature and additionally made the enchanted creature an Icy Manipulator, if it was a White creature. Nature’s Wrath was an anti-Black and anti-Blue Enchantment with an upkeep of just one Green Mana, not a Cumulative Upkeep, just a regular upkeep, so it was much more usable and reliable. 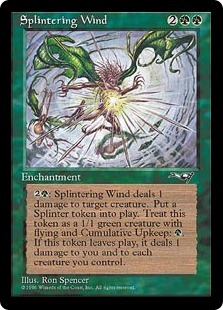 Splintering Wind was an Enchantment that could deal one damage to target creature, but put a Splinter token into play, which was a 1/1 Green creature with Flying and a Cumulative Upkeep that when not paid would deal one damage to you and each creature you control. Taste of Paradise on the other hand allowed you to gain three life and you could gain an additional three life each time you paid one colorless and one Green Mana in addition to its original casting cost of three colorless and one Green Mana. 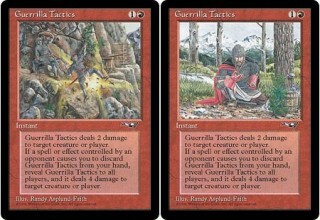 Tornado was an expensive and potentially deadly way to “destroy target permanent,” while Undergrowth was a Fog, that for an additional cost, would not affect Red creatures. Whip Vine was a 1/4 Wall that could block creatures with flying and could keep them tapped as long as Whip Vine remained tapped, which was a great way to handle Serra Angels, other than you know, killing them with spells or something bigger. 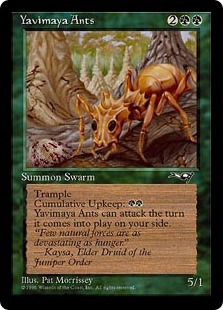 But in my mind, all of the Green spells and creatures pale in comparison to one; Yavimaya Ants. Yavimaya Ants is a 5/1 Green Ball Lightning with a Cumulative Upkeep instead of being destroyed at end of turn. It’s cost is two colorless and two Green Mana, but you’re playing with Green, so the extra Mana won’t be hard to come by and you only have to worry about the Cumulative Upkeep if the Ants survives the first attack. So, if you’re lucky enough to catch your opponent defenseless, you can attack the first time and then keep it around to do some more damage a second time. Personally, I’ve never had an Ants last more than three turns, by then it was always killed by a blocker or by my lack of paying it’s upkeep cost of six Green Mana. The Color Red in Alliances: Damage and Destruction, Red back to its Roots. Red in Alliances returned to its roots; direct damage, destroying things, creatures both big and small and general chaos. Red’s “pitch card” was Pyrokinesis, a Pyrotechnics that not only could cost next to nothing, unlike Pyrotechnics the card it was based on, Pyrokinesis was an Instant and not a Sorcery. This made it not only better because of its cost, but because you were not limited to when you could use it. You could now choose to deal 4 damage any way you chose, to any number of targets, any time you wanted to. Another direct damage card in Alliances’ Red was Guerrilla Tactics, which was much more than just a direct damage card. It was the anti-discard deck card. It cost the same as an Incinerate, but it only did two damage. You may be thinking to yourself, what are the odds? Well, Discard decks were a staple deck in tournament play around Alliances’ release, so if you were playing in a tournament with more than 30 people in it, odds are there were going to be at least 3 discard decks and countless more running discard as a deck sub-type. The most curious direct damage spell to come out of Alliances was Death Spark. It only dealt one damage, but it could come back, again and again and again. “Death Spark deals 1 damage to target creature or player. 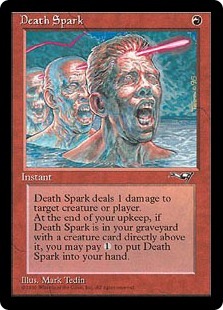 At the end of your upkeep, if Death Spark is in your graveyard with a creature card directly above it, you may pay one colorless Mana to put Death Spark into your hand.” This kind of graveyard specificity was unheard of before Death Spark. It was a very unique concept and it was one that had to be monitored and maintained for effective use. For example, if Death Spark is in your graveyard and you’re sure that a creature is going to die soon, you may hold onto the Lightning Bolt in your hand a little longer, because if you cast it now, the Lightning Bolt will be on top of Death Spark in the graveyard and you won’t be able to get Death Spark back. This kind of thinking was unheard of, before Death Spark and is unique to that card alone. Red in Alliances was not just about spells, Red never is just about spells, there were creatures too. Big ones, small ones and useful ones. 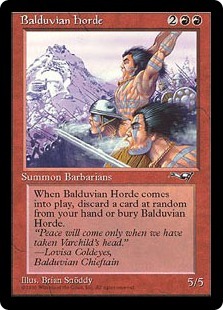 The big creature to be printed for Red in Alliances was Balduvian horde. Balduvian horde was a two colorless and two Red Mana costing 5/5, with a slight casting drawback, “when Balduvian Horde comes into play, discard a card at random from your hand or bury Balduvian Horde.” This may seem like a steep price, but it’s relatively cheap when compared with the only other 5/5 with a converted Mana cost of four Mana; Juzám Djinn. Juzám Djinn was a Black 5/5 from Arabian Nights, but it did one damage to you during your upkeep. This wasn’t an upkeep, it just damaged you until it or you were dead. By comparison, discarding one card at random seems like a bargain. Balduvian horde also made another appearance in print in Sixth Edition, but the horde hasn’t been printed since. There were useful creatures too; Agent of Stromgald, Gorilla Shaman, Soldier of Fortune, Storm Shaman and Varchild’s War-Riders and I’d be remiss if I didn’t mention Enslaved Scout, the lone summon Goblin printed in Alliances. 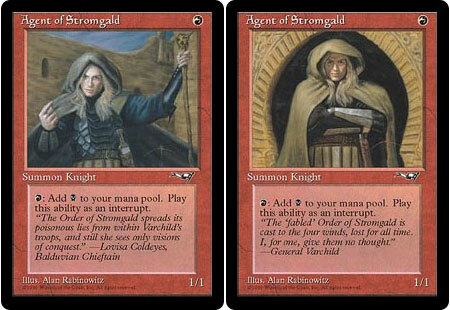 Agent of Stromgald was a 1/1 Knight costing one Red Mana, but his ability was to turn Red Mana into Black Mana, similar to Initiates of the Ebon hand from Fallen Empires. This was a blessing for Black/Red decks when it came to two specific spells, Drain Life and Soul Burn, although it was also useful for casting Black cards in a Black/Red deck, without the aid of any Swamps. Gorilla Shaman was a 1/1 with the ability to destroy target non-creature Artifact by paying twice its casting cost plus one Mana and Storm Shaman was a 0/4, with a build in Firebreathing. Varchild’s War-Riders was a one colorless and one Red Mana casting cost 3/4 with trample and rampage. However, it had a Cumulatice Upkeep of putting a 1/1 Survivor token into play under target opponent’s control. So if you weren’t careful, you could build your opponent an army to reckon with. Let’s just say that it’s a good thing this set was built in the vein of Ice Age, as a Pyroclasm would render all that upkeep to smoldering ashes. Soldier of Fortune was a simple 1/1 for one Red Mana with a great ability; “target player shuffles his or her library.” That’s it, but it is simply brilliant. In this set, with Blue and all of it’s library manipulation, Soldier of Fortune is a reset button for you or for your opponent. So after, they’ve spent all their Mana and a few spells, setting up the perfect draw for themselves, you can step in and make them shuffle their library, of course you won’t make friends with your opponent that way, but this is a duel and you’re trying to win, not make friends. With all of those creatures, surely you’ll not be content with them as they are, so Alliances has two Red buff spells for you to choose from. Beastial Fury is an Enchant Creature that has a cantrip. “If enchanted creature attacks and is blocked, it gains trample and +4/+0 until end of turn.” So your opponent will have to think twice about blocking whatever is enchanted by it. There is also Veteran’s Voice which turns any creature in an Unholy Strength for any other creature you control. Worried about Blue? Don’t be. 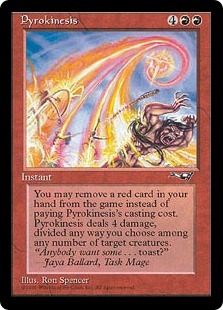 Alliances’ Red had a way to deal with Counterspells, Force of Wills, Arcane Denials and the lot and it is called Burnout. Simply put, “counter target interrupt spell if it is blue. Draw a card at the beginning of the next turn’s upkeep.” So not only can you counter the counter, but you get to draw a card as well. Another way to deal with Blue and White at the same time is Omen of Fire. “Return all islands to their owners’ hands. Each player sacrifices a plains or a white permanent for each white permanent he or she controls.” Granted Omen of Fire does cost three colorless and two Red Mana, but it is an Instant, so you can spring it on your opponent when they least expect it. We’ve seen the direct damage and the creatures and the spells, but what about destruction? Primitive Justice and Pillage are what you’re looking for. Primitive Justice allows you to destroy as many Artifacts as you can spend the two Mana per Artifact cost and if you pay the additional cost with Green Mana you gain a life for each Artifact destroyed, but for pure destruction you want Pillage. Pillage, a one colorless and two Red Mana casting cost Sorcery that says, “bury target artifact or land.” This was an automatic addition to almost every Red deck, not just Land Destruction decks. The reason was because, this was a way to deal with Icy Manipulators, Winter Orbs, Meekstones, Millstones, any Artifact that was giving you trouble, plus because it could also destroy Land, it was very helpful in destroying all of the new special Lands that came out with Ice Age, Homelands and here in Alliances. The Color White in Alliances: Small, Defensive, Preventative and Powerful. Alliances didn’t have a big creature for White, but it did have plenty of weenies, removal cards, damage prevention, life gain and other useful creatures. White’s “pitch card” was Scars of the Veteran, a Sacred Boon that didn’t prevent the next three damage, it prevented the next seven damage to target creature, which meant that you could end up with a 0/4 Birds of Paradise or a 2/5 White Knight, if you prevented the damage from one Lightning Bolt or Incinerate. 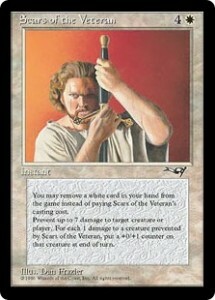 I use Scars of the Veteran in a few of my decks, not for the permanent toughness boost, but for the damage prevention. It’s a quick and painless way to keep your important weenies on the board and boost them for further protection. Scars of the Veteran isn’t the only damage prevention card in Alliances for White, Seasoned Tactician was an 1/3 with quite the activation cost of “remove the top four cards of your library from the game to prevent all damage to you from one source.” But the upside was quite the upside. Royal herbalist, on the other hand, was a 1/1 with “remove the top card of your library from the game to gain 1 life.” All things being equal, you might be better off with the Tactician depending on how much damage you are possibly going to take or trying to prevent. 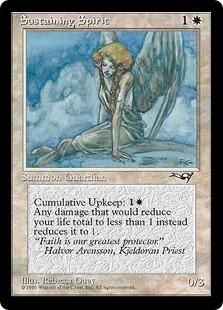 Sustaining Spirit was a 0/3 summon Guardian with a Cumulative Upkeep of one colorless and one White Mana. But for that cost, “any damage that would reduce your life total to less than 1 instead reduces it to 1.” While the upkeep cost could get high, you have the advantage of putting four Sustaining Spirits into your deck, so when one gets to expensive, you can just cast the next one. Just hope that you don’t get Incinerated or Lightning Bolted or Guerrilla Tactic-ed between not paying the upkeep of one and casting the next. Matyrdom was another way to save yourself from taking damage. “Until end of turn, you may redirect to target creature you control any amount of damage,” which may be the way to deflect that Red direct damage Instant from you to a creature, in between losing your Sustaining Spirit and casting the next one. There were two creature removal spells as well, to go with the classic White Swords to Plowshares, those being Exile and Reprisal. Exile removed target non-white attacking creature from the game and gained you life equal to that creature’s toughness and Reprisal simply buried target creature with a power of four or greater. Looking to build an army or rebuild and army? Errand of Duty is an Instant that will put a 1/1 Knight token into play and Reinforcements will put up to three target creatures from your graveyard on top of your library, in any order. Looking to have a creature that just won’t die for better or worse? Ivory Gargoyle is a 2/2 flyer. 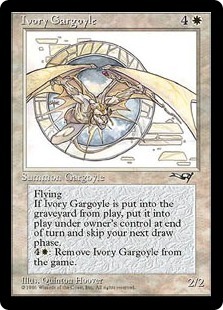 “If Ivory Gargoyle is put into the graveyard from play, put it into play under owner’s control at end of turn and skip your next draw phase.” Of course you can pay an additional cost and remove it from the game, if your opponent is abusing it and you haven’t had a draw phase in three or four turns. Along with Ivory Gargoyle, you may want to use Inheritance, which is an Enchantment that allows you to draw a card, but only if a creature is put into the graveyard from play, and only once for each creature put into the graveyard. This is a cheap way, only costing one White Mana, to still draw a card and keep retaining your Ivory Gargoyle. It’s much like Ice Age‘s Blinking Spirit only without having to recast it every time it gets bounced back to your hand. If it’s defense you’re looking for, there are White Alliances cards to meet and exceed your needs; Kjeldoran home Guard and Sworn Defender. Kjeldoran home Guard is a 1/6 that gets a -0/-1 at the end of any combat in which it attacked or blocked. When the -0/-1 counter is put on Kjeldoran home Guard, a 0/1 Deserter token is put into play as well, so when all is said and done, you’ll have no home Guard and six 0/1 Deserter tokens. This is White, so your Crusade will come in handy to make these Deserters 1/2’s. That Crusade will be even more helpful to Sworn Defender, a 1/3 with a unique ability. “One colorless Mana: Change Sworn Defender’s power to the toughness of target creature blocking or being blocked by Sworn Defender, minus 1, until end of turn. Change Sworn Defender’s toughness to 1 plus the power of that creature, until end of turn.” With a Crusade in play, your Sworn Defender will be able to kill anything blocking or blocked by it and that’s no small task. 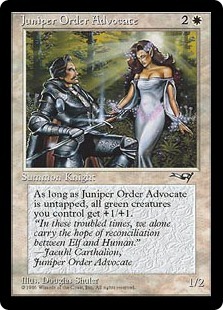 Crusade is great for boosting White creatures, however Juniper Order Advocate is the epitome of the White/Green alliance because this 1/2 Knight gives all Green creatures you control +1/+1 as long as it remains untapped. Again, like Kaysa, it’s not all Green creatures, it’s your Green creatures. This is a Knight that only costs two colorless and one White Mana, so with four in your deck, the odds are in your favor for getting and keeping at least one out in play, if not two, in longer drawn out games. Before there were Artifacts that functioned as Equipment and could be moved from creature to creature there was Kjeldoran Pride. Kjeldoran Pride is a holy Strength giving enchanted creature +1/+2, but for two colorless and one Blue Mana, you can move Kjeldoran Pride from one creature to another. This was a wonderful ability to utilize in order to boost an unblocked creature or move Kjeldoran Pride onto a Rabid Wombat, once you put one into play. White has always been good at targeting Red and Black, but Royal Decree takes that targeting to a contemptible level. This two colorless and two White Mana casting cost Enchantment has a Cumulative Upkeep of one White Mana. “Whenever a swamp, mountain, black permanent, or red permanent becomes tapped, Royal Decree deals 1 damage to that permanent’s controller. This is an astounding card, it targets two colors Red and Black, both permanents and their lands. Moreover, if you’re playing with Blue, a simple Magical hack or Sleight of the Mind will give you the ability to make Royal Decree target any land or color you choose. This card is not defensive or reactive, it’s both offensive and proactive and it works. Why not? The best defense is a great offense. The Gold in Alliances: Standard Spells and Creatures on Steroids! 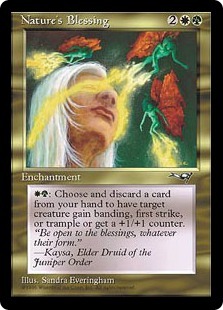 The Gold or Multicolored cards in Alliances were useful, powerful and at times perplexing. Energy Arc was a targeted Fog for one White and one Blue Mana, Nature’s Blessing allowed you to discard a card to put a +1/+1, banding, first strike or trample counter on target creature. Both could be very effective in creature decks. Winter’s Night was an Enchant World that helped snow-covered lands produce an extra Mana when tapped, but didn’t allow them to untap during the next untap phase, so it both sped up and slowed down decks based around snow-covered Land. 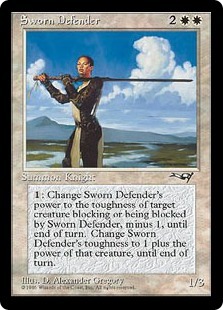 Surge of Strength was a very cheap way to boost a creature’s power and give it trample. It only cost one Red and one Green Mana and the discarding of a card to give target creature +X/+0, where X is equal to that creature’s casting cost. That’s two Mana and a discarded card, a very economical price, for +6/+0 to your Shivan Dragon or +5/+0 to your Serra Angel. Misfortune was another “target opponent chooses one” card and very much a win win card for whomever cast it. “You put a +1/+1 counter on each creature you control and gain 4 life, or you put a -1/-1 counter on each creature that opponent controls and Misfortune deals 4 damage to him or her.” Now given any situation, there is a correct choice, but either of them greatly benefit the caster of Misfortune. It’s cheap to cast and a few life won’t hurt you, if cast early in the game, and you get to maintain the draw you need to keep an advantage in the game over your opponent. That’s library manipulation at it’s finest, unless your opponent has a Soldier of Fortune. Then it was just a lot of wasted time. The remaining Gold cards are two Legends, a Cleric and a Paladin. 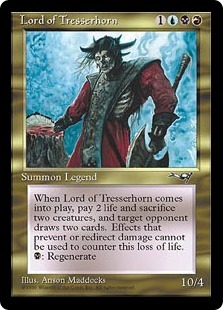 The Lord of Tresserhorn was a 10/4 Summon Legend with Regeneration that had quite the additional cost. To put it into play you needed to pay its casting cost of one colorless, one Blue, one Black and one Red Mana. Then, “when Lord of Tresserhorn comes into play, pay 2 life and sacrifice two creatures, and target opponent draws two cards.” It’s a bit steep, but you are paying four Mana for a regenerating 10/4. 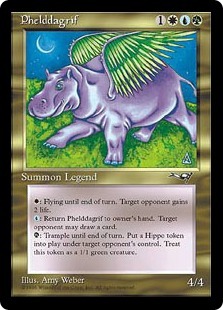 The other Gold Legend in Alliances was Phelddagrif, the “Flying Purple Hippo.” Now aside from the fact that Phelddagrif is an anagram for “Garfield PhD” an obvious homage to Magic: The Gathering’s creator Richard Gardfield, Ph.D., this is a Legend with three distinct abilities. You can choose to give the purple hippo trample and give your opponent a 1/1 green token, give the purple hippo flying and target opponent two life or return the hippo to your hand and target opponent may draw a card. Given the right situation, all of these things can benefit you, but you have to create that situation. I’ve seen the Flying Purple Hippo deck attempted, but I’ve never seen it successful, which is unfortunate, because if you could get it to work, people would laugh as you defeat them. How often does that happen? On the other side, opposing Phelddagrif is Wandering Mage, which also has three abilities, but it is a Cleric not a Legend and its abilities don’t benefit your opponents. The Mage is skilled at “Pay 1 life: Prevent the next 2 damage that would be dealt to target creature this turn,” or “Prevent the next 1 damage that would be dealt to target Cleric or Wizard creature this turn,” or “Put a -1/-1 counter on a creature you control: Prevent the next 2 damage that would be dealt to target player this turn.” All of these are reasonable abilities. In fact, the last one is a great combo with Spiny Starfish. Put the -1/-1 counter on the Starfish and regenerate it as many times as you have the Mana to do so, to create that many 0/1 tokens, then the Starfish dies, you’ve prevented two damage and you have an army of 0/1 tokens. It’s a win win all around. 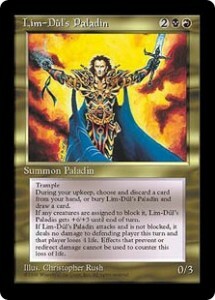 Lim Dûl’s Paladin was one of the most anticipated cards of the set. When the card concept was leaked, players were already hard at work to figure out a way to maximize the Paladin’s potential. For those who are unaware, Lim Dûl’s Paladin is a 0/3 with trample that becomes a 6/6, if it becomes blocked, otherwise it deals no damage and the defending player loses four life. Now, that’s all well and good, Tawnos’s Wand, Dwarven Warriors and many other cards can make a 0 powered creature unblockable, but it was the upkeep cost, people wanted abuse to keep the Paladin in play longer. “During your upkeep, choose and discard a card from your hand, or bury Lim Dûl’s Paladin and draw a card.” Now, even if you cast just one spell a turn, and you cast Lim Dûl’s Paladin’s with seven cards remaining in your hand, you only have three turns before the remaining card in your hand is for upkeep and not for using. This meant that if you had a combo out to make it unblockable, you were only going to deal 16 damage to your opponent before you ran out of cards. Now that isn’t bad, but 16 is close and this isn’t horseshoes or hand grenades, you need to deal 20 damage to win, not 16. So how do you get around this? 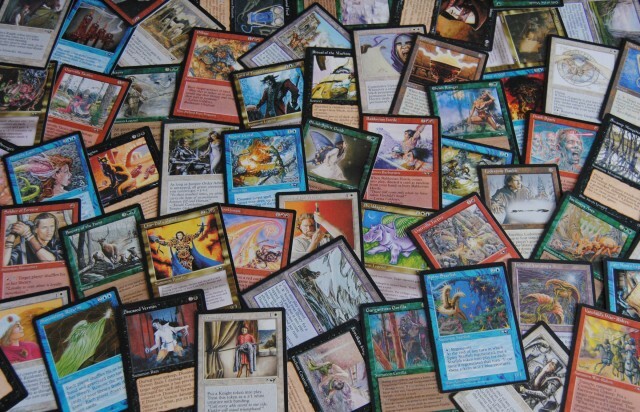 Most people loaded their deck’s with a playset and put in as many cantrip cards as possible to try and stay ahead of the curve. But the best way to keep the Paladin around is Howling Mine. Of the two cards you’re drawing each turn, one is going to be discarded, but you can still actually play the other should the need arise. The Artifacts in Alliances were useful and welcome additions to many decks. There were some basic cantrip Artifacts; sacrifice your Astrolabe for two Mana of any one color, sacrifice your Scarab of the Unseen to return all enchantments on target permanent you own to owner’s hand. Both of these were used as much for their actual abilities as their cantrips. Helm of Obedience was a welcome addition to Millstone decks, because not only did it mill your opponent’s library, it also allowed you to steal a creature. This was a huge advantage to Millstone decks, as you could protect yourself or attack your opponent with their own creature. Storm Cauldron was added to Winter Orb/Icy Manipulator/Ankh of Mishra based decks. Returning tapped Lands to owner’s hand, meant if opponents wanted to spend that Mana again, they would have to put it into play again and take damage from the Ankh of Mishra. Land manipulation was also the key function of Mystic Compass, which turned target Mana-producing Land into a basic Land type. So all of those great Alliances Lands could be rendered basic Lands until end of turn. Shield Sphere marked the end of Ornithopter’s reign as the only non-Kobold zero casting cost creature. Gustha’s Scepter was like Safe Haven, but for cards in your hand. This was great if you wanted to play a Diminishing Returns, or wanted to save a card or two from your opponent’s discard deck. Armageddon and Jokulhaups based decks were aided by Lodestone Bauble, which put up to four basic Lands from any player’s graveyard on top of their library and had a cantrip ability. This could be used for your own self preservation, to get land back after you Armageddon, but it could also be used to slow down your opponent. If they are looking for a card late in the game, it would be a shame if their next four draws were all Land. Sol Grail was a “choose your own diamond” before there were diamonds. Choose a color when it comes into play and Sol Grail can be tapped for that color Mana. It may have cost three colorless Mana, but choosing the color you needed at that time made it well worth the extra Mana to cast, when compared with the Diamonds of Mirage and Fellwar Stone. If you were willing to remove cards in your library from the game, Whirling Catapult was a permanent hurricane for you to use whenever the need should arise. Phyrexian War Beast was a cheap 3/4 Artifact Creature that when it left play made you sacrifice a Land and dealt you one damage. But as a turn two play, it was a 3/4 that was well worth the risk, as it couldn’t be killed by a mere Lightning Bolt or Incinerate. The Artifacts of Alliances weren’t left out of the library manipulation game either, Phyrexian Portal and Soldevi Digger were standards in all library manipulation decks. Phyrexian Portal was library manipulation with your opponent’s help. Your opponent looks at the top ten cards of your library and separates them into two face-down piles. Choose one of those piles and remove it from the game, search the other for a card to put into your hand and shuffle the remaining cards back into your deck. This was a gamble, as allowing your opponent to sift through your cards could be an advantage to them, but it could be a risk worth taking. Soldevi Digger was the the permanent, slower version of Feldon’s Cane. For two colorless Mana you could “put the top card of your graveyard on the bottom of your library.” This was great with Death Spark, as you could always keep it in line for a creature to fall on it in the graveyard and get it back, but it also meant that with all of the reshuffling and library manipulation added to Alliances, the Counterspell you just used, could be drawn again in a few turns. 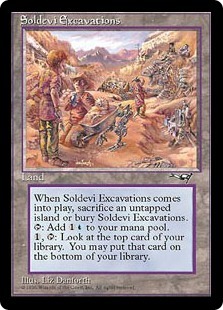 Soldevi Digger was invaluable for any control deck, because it gave you the potential for a neverending supply of Counterspells and Arcane Denials. Alliances changed the game. It changed the way it was played, how decks were built and even how spells were cast. The pitch spells, although not printed again, were hugely successful. The library manipulation, in this set alone, is legendary. If you need to manipulate your library, Alliances is the first place to look. And then there is the legacy of Alliances. As a follow up to Ice Age, it was a proper follow up. The changes in Magic due to Ice Age, may have felt like huge earthquakes felt throughout the game, but compared to the super nova of changes that happened because of Alliances, Ice Age seemed tame. This may be why we haven’t seen a set like Alliances since, well, Alliances. The Alliances legacy of cards isn’t a short list; Arcane Denial, Balduvian horde, Force of Will, Contagion, Bounty of the hunt, Pillage, Elvish Spirit Guide, Thawing Glaciers, in fact, the whole set is its own legacy. 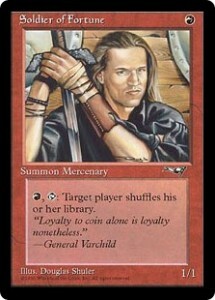 I know the game has changed since Alliances was released in 1996, but I don’t think one single set since has had the impact on game play and deck building as Alliances did, on Old School Magic. It is far and away, one of the best sets that Wizards of the Coast ever produced.